You love your cat, but you don't necessarily love the amount of litter that seems to make its way from the litter box around your house. Even if you have a larger litter box, a well-trained cat, and a litter mat, litter can still spread to areas where you don't want it to be. 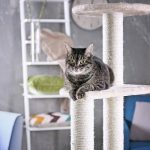 However, the best vacuum for cat litter can help you stay ahead of any cat litter in your home, and this can give you a cleaner and healthier environment all year. We reviewed our top five best vacuums, and we also put together a buyer's guide because we want you to understand what sets these vacuums apart from ordinary vacuums. Clogs - When you pour cat litter, take a few seconds to look at all of the dust that appears due to the dry clay composition of the litter. This dust could build up around your brushes or deep in your vacuum's motor and cause it to overheat and burn out. Damage - Cat litter has hard clay granules that travel at high speeds through your vacuum, and this can cause damage to your more fragile components either by hitting them or getting stuck and jamming them. This can cause your vacuum to fail or burn up as it struggles to run. Mold - If you vacuum up cat litter and then vacuum up wet or damp items, it creates a perfect environment for mold to grow and thrive. You can blow this mold out throughout your home, or it can simply stop your vacuum from running as well as it should. Odor - Depending on the litter, it can have a stronger perfume odor that lingers around your vacuum long after you finish cleaning. Additionally, soiled cat litter can have a strong odor that doesn't leave your vacuum once it sets in, and you can spread it to the rest of your house. One of the first things that you want to do is decide which type of vacuum you want to get to clean up with your cat litter. Once you settle on a type, it'll help you narrow your search down, so you don't get so overwhelmed. Canister vacuums come with a dirt containment canister, motor, and a separate power head that lends to the lightweight look and feel of the vacuum. They're great for getting into tight spaces, but the canister makes this slightly more difficult to maneuver around. Perfect for areas directly around the litter box, tight spaces, upholstery, and stairs, handheld vacuums are very lightweight and portable. They can handle litter, and they can either have a bag that you remove when it gets full or a canister that you dump. 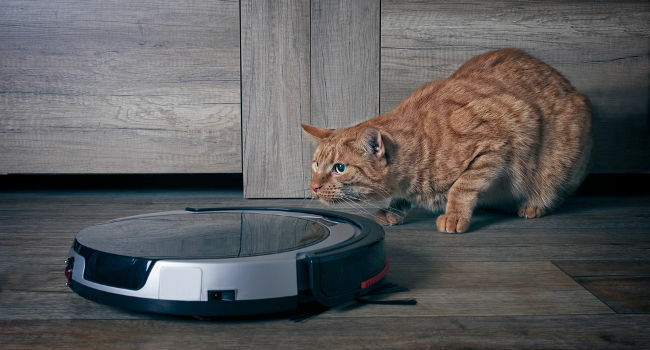 If you want something that will automatically clean around the litter box once or twice a day, you can get and program a robotic vacuum to do so. However, it won't be able to tell when the cat litter is wet or damp, and this can lead to clogs if it routinely tries to clean it up. Stick vacuums are extremely slender, lightweight, portable, and great for a lighter option to clean up cat litter. They do tend to lack the power of full-sized vacuums, but the convenience factor of being able to carry them around and quickly use them and put them away make up for it. Upright vacuums feature a sleek and streamlined design that combines the dirt bag or canister, cleaning head, and every other feature into one single and portable unit. They can simplify the cleaning process, are easier to store, but they're usually heavier at over 20 pounds. A wet and dry vacuum is a shop vac, and it's capable of taking on both wet messes and dry messes without clogging or breaking, and they can also clean up messes like glass, nails, or wood chips. They are more cumbersome, but you should be able to use them right around your cat's litter box without a problem. Now that you know what the different types of vacuums are and why you should consider getting a vacuum that comes designed for litter, we're going to go over a few things you want to keep an eye on. This will help you pick out the best vacuum for your needs without breaking your budget. A bagged vacuum has fewer opportunities to spill, and they tend to lock in odors better than a canister. However, a canister is easier to clean, and it also prevents small particles of litter from building up in the small nooks and crannies and starting to smell. A bypass flow motor works to keep the air and dirt separate in your vacuum, and this can help to prevent clogs as you vacuum up different debris. It also helps to keep your suction strong as you move from one flooring type to the next. Since these vacuums can be more expensive, it's critical that you get a durable vacuum that comes designed to take on pet hair, litter, and pet-specific messes. When you combine this with vacuuming your home each day, you can extend the life of your vacuum by a few years. Your cat may track litter a long distance around your house when they're out and about, and you want a vacuum that is easy to move and maneuver from room to room. It should be lightweight, slender, and powerful with a variety of attachments that makes your job easier. Your suction is going to be essential with this vacuum because you're going to need it to pick up slightly larger debris with the litter. Look for a vacuum that transitions to different flooring types without losing the suction level, and make sure that it can handle both small and large debris. The Bissell pet vacuum is a very lightweight and durable pet vacuum that has powerful suction combined with an innovative brush design that cleans litter and hair in one sweep. The brush digs in and rotates into the carpet to give you a perfectly clean floor each time you use it. The cyclonic system works to keep debris out of your vacuum head, and this helps to improve the overall suction of the vacuum after repeated use. The TurboBrush tool is excellent for cleaning litter out of stairs, furniture, upholstery, and more quickly and easily. The clear tank comes with an easy open and removal latch that allows you to dump it when it gets full, and the clear design allows you to monitor dirt levels. It has multiple levels of filtration combined with a foam tank filter that you can rinse and air dry to keep it clean. Cat parents who bought Bissell's pet vacuum were impressed that the brush rotated down into the lower layers of their carpet to get a deep and lasting clean. Cat parents did note that you have to make more than one pass to pick up pet hair, but litter came up in one. 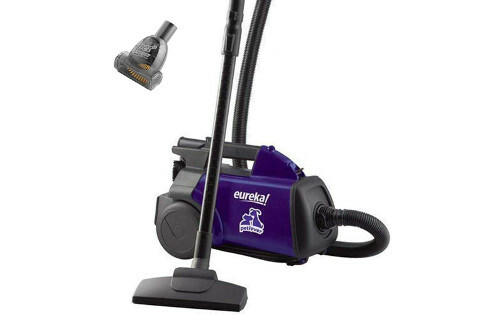 Eureka's vacuum is specially designed to pick up pet hair and pet messes like cat litter. The dust bag inside the vacuum is one that works to absorb and neutralize odors for a cleaner look, feel, and smell each time you finish vacuuming. You get a 20-foot cord paired with an extension wand arm that helps you reach into all of the nooks and crannies in and around your home. This vacuum is very lightweight at just nine pounds, and this makes it easy to pick up and carry around from room to room. The top of the vacuum features a switch that snaps open and allows you to switch out the bag or empty it quickly and easily without worrying about spilling the contents. There is also a blower port that blows debris from inside your workshop or garage when you set it up and let it run. Cat parents who purchased Eureka's vacuum liked that the vacuum's bag comes with odor-blocking technology that neutralizes odors while you vacuum. Cat parents didn't like that Eureka's vacuum had a stiffer hose that was prone to kinking or breaking with a few uses. Shark's vacuum features a swivel head design that lets you seamlessly maneuver the vacuum to clean harder to reach areas. The vacuum comes equipped with a rapid four-hour charging capability and a two-speed brush roll that seamless transitions from flooring type to flooring type to pick up ground-in litter and hair. You'll get an extra large canister to hold more debris that allows you to go more cleaning times without dumping or cleaning it. 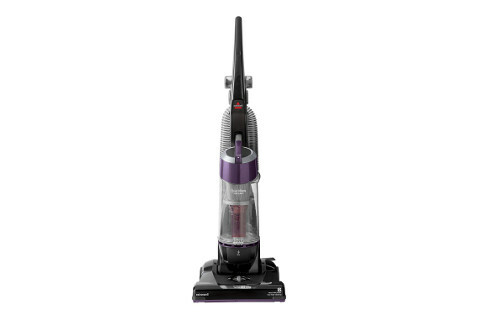 It comes with a slightly wider head that covers more space per sweep, and it's a lightweight and portable vacuum choice. To clean and maintain this vacuum, all you do is empty the canister when you notice that it's starting to get full, and you can wash it with warm water and let them air dry. You get an adjustable handle that allows you to clean stairs or higher places. Cat parents who bought Shark's vacuum were pleased that it comes with swivel technology that allows them to maneuver their vacuum around their home seamlessly. Cat parents were not pleased that this vacuum has a brush head that easily gets clogged with pet hair. Bissel's vacuum comes with three specialized pet tools that allow you to adjust the vacuum to get a superior clean on different surfaces. 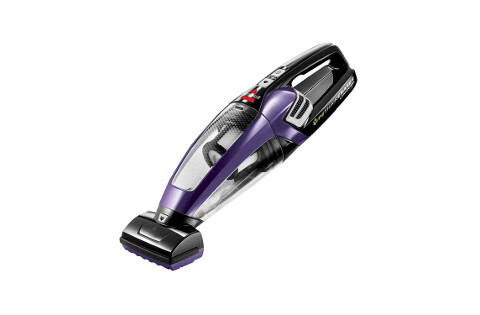 At just over four pounds, this vacuum is extremely lightweight and easy to move or carry around your home. It comes with a durable and rechargeable Lithium Ion battery that charges quickly and gives you up to 17 minutes of running time on a single charge. There is a large debris canister with triple filtration technology that allows you to quickly and easily pick up pet hair, food, and litter. When you finish, and you're ready to put it away, the smaller design gives you a more compact storage option. The canister comes away from the vacuum with the touch of a button, and this makes cleaning and routine maintenance easy. Pet parents who bought Bissel's vacuum liked that this vacuum came with three different specialized pet tools to clean different surfaces. Pet parents didn't like that this vacuum had a dust collector that was difficult to remove and empty without spilling dust on the floor. iRobot's Roomba vacuum comes with a three-stage cleaning system that adjusts by itself to clean different floor types without losing suction. It comes with a dirt detection system that makes the vacuum work harder in areas where there are more debris. It comes with a sleek design that fits almost any décor, and the Roomba also features a full suite of sensors that guide the vacuum around your home without getting stuck. You can set it to clean or schedule cleaning sessions anywhere when you use the app on your phone. This vacuum will run up to 90 minutes before it returns to the docking station to charge, and it has a brush that is specially designed to sweep the edges of walls and around items like a litter box. It can quickly and easily grab everything from smaller debris like pet hair to larger litter pieces. Cat parents who bought this robot vacuum liked that it had a powerful suction head that self-sealed to the different types of flooring for an even clean. Cat parents didn't like that this vacuum tends to get stuck on dark rugs because it thinks that it's on the edge of something. What's the Best Vacuum for Cat Litter? 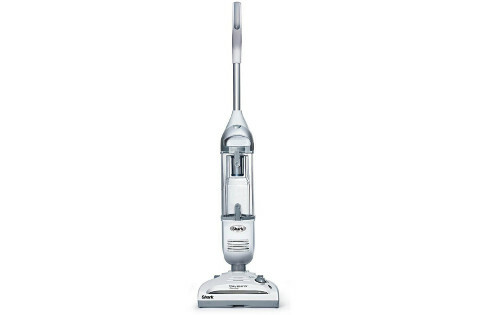 Our pick for the best vacuum that works on cat litter is the Bissell 9595A CleanView Bagless Vacuum with OnePass because it has an innovative brush design that cleans cat little in a single sweep. We picked it because they brush digs into the bottom layers of the carpet for a superior clean. The fact that this vacuum comes with multiple filtration systems and a HEPA filter also put it as our first pick because it combats allergens. Finally, we were happy that this vacuum had a durable but lightweight design that made it fast and easy to carry around from room to room.